Connecticut » Blog » Water Damage Restoration » When Does Water Damage Take on the Semblance of a Horror Film? When Does Water Damage Take on the Semblance of a Horror Film? This may seem like a scene from a horror film, but water damage caused by freezing cold weather is an all too common occurrence in Connecticut. Have you ever left a can of soda in the freezer only to forget it? You have undoubtedly noticed that as the liquid in the can freezes it causes the can itself to expand and eventually split and burst soda all over the inside of your freezer. The pipes in your home react in a similar way, but with a slight difference. Pipes do not burst open in the area where the ice blockage originates. Rather, a pipe burst is caused when the water in the pipe gradually freezes and expands in the pipe causing water pressure to increase between the faucet and the ice blockage. This causes a tremendous amount of pressure, which in turn can result in a flooded basement, flooded crawlspace or severe water damage in any part of the home where pipes are vulnerable to freezing weather. The catastrophe caused by pipe bursts can cause major damage to your home and possessions. Coming home to such havoc is a frightening disaster that makes an encounter with the wolf man or a mummy a skip through the park. Pipe bursts are common culprits of chaos. “It was scary”, was the description nursing home resident Ann Owens gave CBS reporters when a frozen pipe burst caused her nursing home to be evacuated. An emergency water damage crew discovered that the problem originated from a burst water pipe on the fifth floor that was part of a sprinkler system, and that it had been leaking for two hours. Had the leaking pipe been detected earlier, it is likely a professional water damage restoration company could have prevented the disaster from unfolding. But the community can learn a valuable lesson from this: never ignore a leaking pipe. It may seem arbitrary and not worth your effort to have the problem addressed, but ignoring a small leak can result in a massive home or business flooding. Ignoring a leaking pipe is especially negligent when you have an experienced water damage company in the area that offers a free inspection and estimate and that shows up at your front door within 45 minutes of your call. Like a famished zombie wandering the empty streets for sustenance, it’s a “no brainer”. One of the many advantages to having a free inspection performed by a water damage restoration specialist is that it could uncover other hidden horrors lurking silently in the shadows. For example, mold spores thrive in moist environments, and leaking pipes cause moisture. On hundreds of jobs water damage companies discover mold spore colonies while inspecting a leaking pipe. They spring into action providing immediate mold remediation services after the pipe leak has been corrected thus protecting the health of families. But sometimes water damage restoration pros uncover horrors unimagined (see photo). 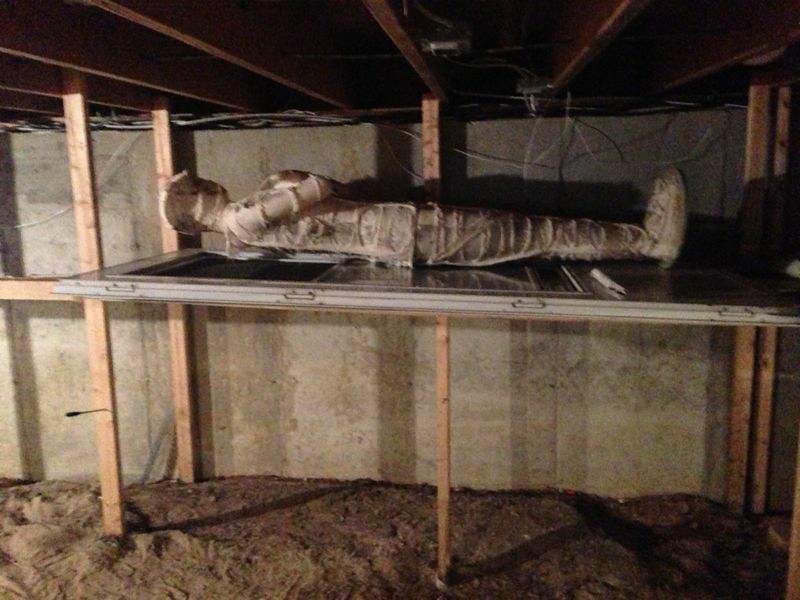 A technician from 911 Restoration encountered what appeared to be a mummy tucked away while engaged in a major job in Queens, NY: “we didn’t want to touch it in case he wakes up”, reported the shocked yet amused water damage crew member. The scientific community has yet to confirm or deny that mold does or does not cause mummies to form and reanimate. We are on call 24/7 to respond to any emergency situation or concern. If you discover a leaking pipe, give us a call and leave the rest up to our experienced water damage team. The inspection is free, and who knows, we might just find a mummy hiding in your basement or crawl space!